Back in 2012, I had no idea that perfect moments passed as dust in the wind and that I should take the time to enjoy the lighthearted life that I was leading. I had no clue that the road I thought was ahead of me was going to collapse. In my adult life, I had been ignorant to hardship and heartbreak. I had surrounded myself with a thick glass wall of protection from the big, bad, evil world. I believed that as long as I stayed within the impenetrable walls that I would be safe. It never occurred to me that glass shatters. It never occurred to me that I would want/need/plea for time to be stopped. This is my story—no, not just mine, but Eli’s, and the circle of strength and love that is my family. I was sixteen years old the first time a doctor told me it would be impossible to have children without fertility help due to polycystic ovarian syndrome. Over the next several years, three more doctors confirmed the diagnosis and echoed their opinions that I would not be able to have children easily. Honestly, I never really let their medical opinions sink in and was pretty flippant about the diagnosis until I began dating my husband. As our casual dating became serious, I was suddenly terrified to tell the man I was falling in love with that marrying me could mean he would never have biological children. I knew I wanted to marry him when his response was, “No big deal, do you know I have several cousins that were adopted?” As such, imagine our surprise when a few months after our one-year anniversary the pregnancy stick had two lines. “Screw you doctors!” is what that line said. Nine months later, my first miracle was born, and I wept with joy over her. We waited to try for another child, and four years later, we welcomed my second miracle full of sugar and spice. My heart was full with little girl love and giggles, so we chanced the miracle card one more time. In October 2011, once again the stick had two lines. We had our girls crowd around the ultrasound machine to get a glimpse of their new sibling, and to all of our shock, this new baby was a boy! A boy? Really, God? Our home is pink with baby dolls and play kitchens. What on earth do I know about boys?! But another girl or boy did not matter because a perfect, walled-off family of five sounded darn right ideal to me. My pregnancy with the little guy up until the third trimester was relatively easy, although I was bigger than when I was carrying my girls. During an evening walk (which was more of a waddle), a neighbor stopped me to comment on my how big I had gotten and chalked it up to him being a boy. I took that as truth and put it out of my mind. I cannot stress enough how absolutely normal my pregnancy was leading up to my 30-week check-up. During that routine ultrasound, I was wrapped up in staring at the cute little toes and him sucking his thumb; I didn’t notice our technician’s look of concern. Even a few days later, I was so unaware that anything could be wrong, I went alone to hear the doctor’s results. It is at this very moment where I would like to begin the "freezing time" superpower. I entered that doctor’s office as an ignorant, lighthearted, pregnant mother, but boy oh boy, I surely did not leave that way. My world went upside-down the moment I walked into the sterile patient room and heard the words no mother ever wants to hear. "There is something wrong. His head is measuring on the big side. I want you to schedule an appointment with a fetal specialist right away." I think the rest of the conversation sounded like the teacher in Peanuts (the unintelligible gibberish of “Wa wa wa wa”). It was already unbelievable, and I had no idea that the nightmare was just beginning. We needed to see a neonatal neurosurgeon. After the doctor left and closed the door, I clung to my husband as my body convulsed with sobs. I felt like someone ripped out the word "normal" and threw in "chaos" instead. I had no clue what to do next. Who to call? Who to tell? Oh my gosh, what do we tell our girls?! Did the world stop? I really would like the world right now, as I write these words, to pause because my brain cannot think and my eyes will not stop crying. The states of powerlessness and helplessness entered my life and began to take up residence. Chaos, heartache, and sheer panic dictated the next six weeks before his birth. Suddenly, the normal pregnancy was precarious and delicate. On tap were six weeks of appointments over two hours away, bed rest when I was home, and people coming and going to help take care of me, our girls, and our home. This would be six weeks of trying to research all of the possible outcomes and the full realization that we just did not know anything. In a way, it is funny to look back, after his birth and his real, true diagnosis, and realize that all attempts at "research" were futile, since I was looking in all the wrong places. My son’s head was extra large with brain fluid increasing every day, so my body began hurting and was being pushed beyond what I ever thought imaginable. I could barely walk to the bathroom, and I had to use a wheelchair for doctor appointments. The long van rides to the doctor’s office gave me contractions, so I was often kept longer at the hospital in attempts to calm the contractions and keep him inside me a little longer. There was no time to reflect on the chaos. Just keep moving, just get to the next day, just keep praying that he will be okay. My prayers became desperate whimpering pleas with so much hope that maybe we would receive a miracle. I hurried through those six weeks clinging to that hope of a miracle and if I just met my son—if he survived past birth—that all would well. The fetal specialist and the neurosurgeon came to agreement on when to deliver our precious son. At 36 ½ weeks on May 24, 2012, Eli David was delivered via cesarean section. If you are a mother, then you know that sound you are waiting for: the wail of your newborn child. What a joyous wail my boy had! My baby was alive, and yes, he was crying! He was thrust in my face for the quickest of hellos and a kiss before being whisked away to the NICU. The whimpering, pleading prayers began for him, for the doctors, for the nurses. My cesarean section was brutal on my body, and it was demanded that I rest and not travel across buildings to see Eli in the NICU. Like hell you will keep me from my son! My body be damned! But I was too weak from blood loss to do anything but rest. The next morning, Eli’s neurosurgeon had scheduled an MRI and surgery to place a shunt to begin draining the fluid from his brain. I won the battle to be there with him before surgery. In my wheelchair, I was scooted as close as possible to his pod. I began to whisper, "Hello, my Eli, my sweet baby boy. I’m your Momma and I love you so very, very much. You and me, see, we are fighters and we are going to fight to stay together until God tells us otherwise." And with only a few more whispers, he was taken away to surgery. Eli’s brain function drives the plan. Currently, he is breathing on his own which means his brain is sending the correct signals to his lungs to breathe. He is alert, not having seizures, his jaundice has gone down, he is taking breast milk from a feeding tube down his throat and having normal baby movements (his nurse claimed he smiled at her today). All good brain signs. Unfortunately, this could change. Eli’s brain is in charge. We spent a week in the hospital so that my body could recover and so that we could be as close to Eli as possible and continue to meet with his medical team. We were introduced to the wonderful generosity of the Ronald McDonald House, which was a welcome reprieve from the overwhelming NICU life. Eli had six doctors, a slew of residents, and even more nurses. There was medical language to wrap my head around, a rare disease that baffled even the physicians, time schedules to learn, medications to agree to—the list goes on and on. I was drowning in ignorance. My only small intelligent act was to carry a notebook and write everything down. That little notebook ended up detailing every conversation, medication, seizure; it was truly my saving grace in NICU life. I tried to savor every moment of his first week with him just as if he were home. He was still like most babies who wailed when pricked for blood tests, cooed when snuggled close, annoyed when his diaper was changed. The contrast of normal versus rare disease could sometimes be forgotten as he cuddled sleeping in our arms. 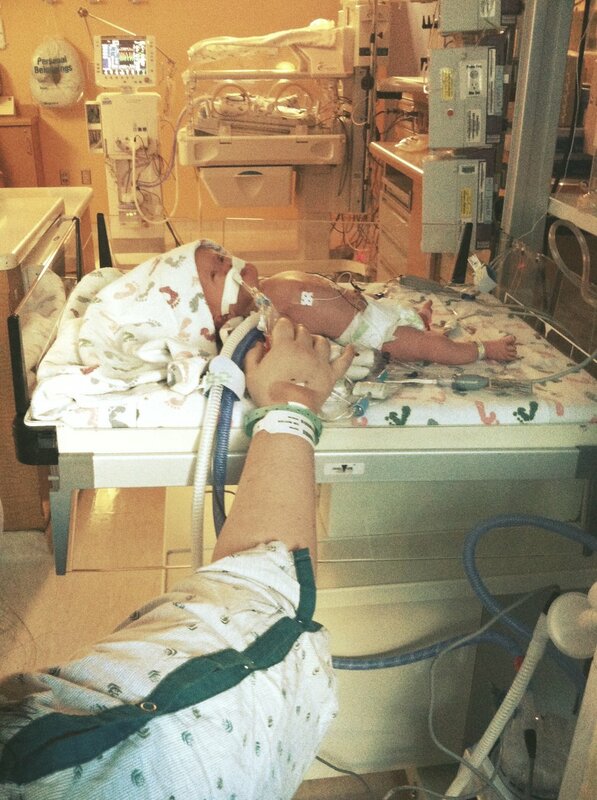 The hum of the machines and the other NICU noises faded into the background when he was snuggled on my chest. Our little world was tucked into the very last pod of the hospital wing, and there we were: just me and my baby boy listening to Adele and snuggling. But of course, over two hours away we had two other children waiting for us at home. We needed to get home to them, as well. Thus began another battle within me. How does one split time between their healthy children and their very sick baby? How does one split their attention? How does one juggle NICU life and summer life without destroying their children’s childhood in the process? Eli was an explosion to the life we had always known, and I had no one clue how to navigate it well. On his seventh day of life, we drove back home to our girls without Eli. I will never forget the moment of driving away from the hospital, looking up at the window I knew was his, and sobbing into empty arms. Who does this? Who leaves their baby behind to go home to comfort? What kind of awful mother am I to leave behind my sick child? So what if my body needed real rest to heal? There were sobs upon sobs, questions followed by still more questions as we drove home to the complete joy of my healthy children who missed their momma more than anything. Walking back into my home without my son, I realized just how fully immersed I was in a world of contrasts, and this was just the beginning. My head and my heart fought constantly that summer—over what was right, what was true, what needed to be done, and what was wishful thinking. Yet, mostly I just fought and sometimes fought blindly. Swinging my sword of justice, I fought for my son, for his life, for him to know love and comfort and peace even as the seizures began to wrack his little body. I fought for more time with him. I battled for better care for him when I couldn’t or didn’t know how or what exactly that meant or even looked like. I fought to understand what was happening inside him and fought the residents who said I was a fool to keep fighting so hard. I went to the battlefront for my boy, and though exhausting, I would do it all over in a heartbeat and even come out swinging some more. They say there is no greater love for a child than a mother’s love, and I poured out my all for him to know my complete, unconditional, undying love. This post was originally shared on September 25, 2016.